As the impact of my Mother’s death lessens, I can now put into perspective the way my body reacted to the grief at losing my Mother to cancer last year. Some have likened the grief process to accelerated ageing, with changes to metabolism, increased muscle stiffness, joint pains, loss of vitality, and a general state of ‘foggy’ head. I have experienced all of this over the last seven months. When you are going through the grieving process, though, it’s just all part of the coping mechanism; not to pay too much attention to the individual effects, and rather concentrate on becoming a whole person again, even though you have lost a loved one, an important part of yourself. I have written previously about how my grief started before Mom died, because her illness was so extensive, we knew there was no hope. I don’t know if this helped or hindered my recovery. I don’t suppose anyone can tell. It affected my sleep, I suffered weight loss, aches and pains, and felt hollow inside. After Mom died, there was a brief period of well being, mainly relief because Mom was no longer suffering, and that it was all over. I wasn’t thinking about the future, just getting through each day. It wasn’t a conscious decision; again, it’s just part of the process. The mind taking over, in order to protect the body. The legalities of death and probate hit you at a vulnerable time, and I found that many of the companies who should have specific staff to deal with probate and help families are woefully ill equipped to do so. Banks, building societies and HMRC are the worst. If I had had more energy at the time, I would have created a scene – perhaps I still will. And for me, it was the legal and financial stuff that set me back. It made me angry, and that was unhelpful. It wasn’t anyone’s fault that Mom died. I couldn’t assign any blame, but those companies made it so much worse. It’s tempting to want to put a time frame, or deadline, on grief. I knew I shouldn’t but psychologically Christmas, Mom and Dad’s wedding anniversary, Dad’s birthday and Mother’s Day all came and went with a slightly numb ‘let’s not cry’ feeling. We planned a wonderful holiday to a tropical paradise. I rested and felt restored, but still came home feeling so tired. So tired in fact that those around me thought I was seriously ill. Two more weeks past, and slowly but surely I was able to exercise for longer, and more efficiently too. But the aches and pains have been slow to recede. Arthritic flare-ups have impeded by recovery, ligaments in my feet have been inflamed too. It’s not been all bad. Not every day is painful. It seems to be when something else causes a small stress in every day life, that my resilience is low, and my body tells me so. It’s been quite difficult to find information on this topic. Most of what is out there is written from a complementary therapy point of view. It seems a little recognised topic on the part of the medical people. I have already questioned the GP’s wisdom about just leaving someone to grieve after a significant bereavement. I’m not suggesting that drugs are required, simply that more attention needs to be paid to these physiological, as opposed to psychological, symptoms of grief. 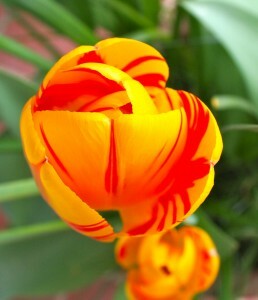 Spring days, warm sunshine, wonderful colours are all contributing to the healing process. Human beings are after all part of the natural world. I am fortunate to be surrounded by nature, renewal and re-birth, living as I do in the countryside. So if like me, you are grieving the loss of a loved one, be kind to yourself. Understand that it’s not all in the mind. Your body will be taking a battering too.